EAST NEW YORK, Brooklyn (WABC) -- A man in Brooklyn is lucky to be alive after a freak accident resulted in him being struck by a steel beam on Thursday. 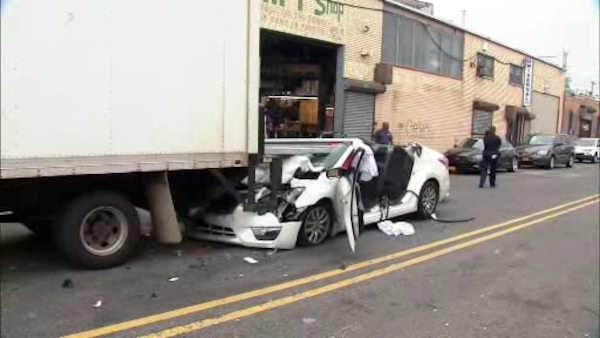 The accident occurred as the man was driving through East New York in a Nissan Altima, as a truck was double parked and being loaded outside a warehouse just off of the intersection of Louisiana Avenue and Dewitt Avenue. Witnesses say that the man somehow rear ended the truck just after 4 p.m., causing a steel beam sticking out the back to go through the car's windshield and hit the driver. Firefighters needed to cut open the vehicle to get the man out. He was rushed to Brookdale Hospital in serious condition.